Xavier Grobet is a cinematographer known for his work on Focus (2015), Monster House (2006) and I Love You Phillip Morris (2009) I had him on the show to discuss his latest collaboration with writer/director Mike White, Brad's Status. 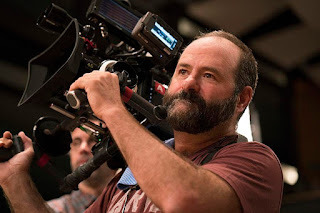 We also discuss the challenges in working with handheld cameras, how he lays out the visual strategy for each film, and (of course) how to create a convincing shot of adolescents snorting cocaine. Brad Sloan has a satisfying career and a comfortable life in suburban California, but it's not quite what he imagined during his glory days in college. Sloan keeps comparing his life with those of his four college friends, wondering what it would be like to have their well-paying and glamorous jobs. When circumstances force Brad to reconnect with his buddies, he soon begins to question whether he has failed, or is in some ways the most successful of them all. Brad's Status is currently playing nationwide and it marks Mike White's strongest effort to date. The film feels somewhat like the Albert Brooks films of the 70's and 80's filtered through White's unique perspective. The film stars Ben Stiller, Jenna Fischer, Michael Sheen, Luke Wilson, Jemaine Clement, and Austin Abrams. To hear my interview with Xavier click play on the embedded player below.